Replicative transposition is a particular transposition event that is used by transposable bacterial viruses to replicate their genome. The key enzyme responsible for replicative transposition is a DDE-recombinase (MuA) . The best studied transposable bacterial virus is bacteriophage Mu. During replicative transposition, interactions between DDE-recombinase A (MuA) four core subunits, the DNA ends and the enhancer (IAS) form the stable synaptic complex (SSC) . The target DNA activator protein B (MuB) brings the target DNA to the transposition complex. 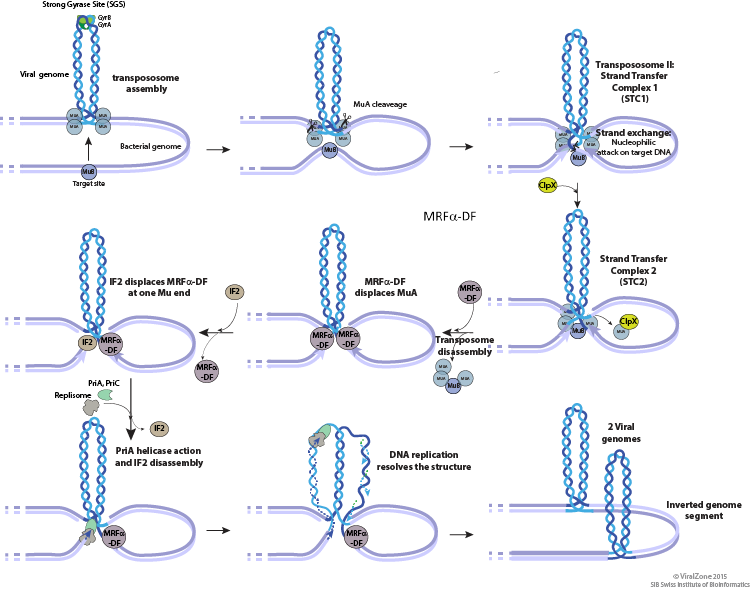 DDE-recombinase A associated with MuB mediates single-strand nicks at the 3' ends of the integrated viral genome followed by strand transfer of the 3'-OH cleaved ends to the 5' ends of the cleaved cellular target DNA . The flaps DNA are not resected by DDE-recombinase A and the resulting branched strand transfer joint is resolved by target-primed replication, which is initiated by the host PriA primosome and completed by host Pol III holoenzyme, resulting in two copies of the viral genome . Host ClpX plays an essential transpososome-remodeling role by releasing the block between transposition and DNA replication. Successive rounds of replicative transposition can lead up to 100 copies of the viral genome.